Salomon Zaligman  always called Sale in his birthplace  was born at Dwingeloo in 1902 and married Evalina Froukje Wilda in Coevorden on 29 October 1924. She was born there on 8 May 1896. The couple went to live at Dwingeloo, where they had a clothes shop. Here their two daughters were born: Hendrijette in 1926 and Hendrika one year later. The family lived in the ‘jodenhuus’ (Jewhouse) on de Brink. It is still there. In the side wall we can still read ‘S. Zaligman jr’ carved with a sharp object in a brick. 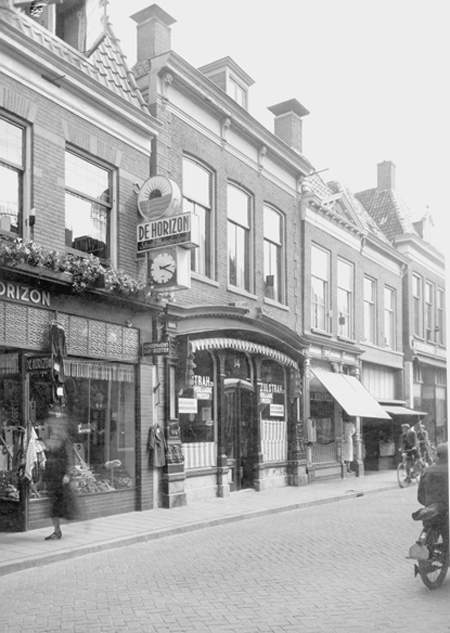 In 1933 they moved to Meppel, where they started a drapery called ‘De Horizon’, together with Salomon’s brother Philippus, as mentioned before; first at 6 Woldstraat and later at 16 1st Hoofdstraat. The drapery owned by the Zaligman families was at first at Woldstraat 6, but when the shop became too small, they looked for a larger place, which they found in the Hoofdstraat. Textiles trader Wolf was interested in their old shop to start a business there himself. They came to an agreement upon one condition. Mr. Wolf was only allowed to open his shop a month after Mr. Zaligman had left it. The latter did not want to lose his customers. And thus it was done. The family lived in Woldstraat from 1933 till 1936, but later went to live above the shop in the Hoofdstraat. Here their third daughter, Mientje, was born in 1933. 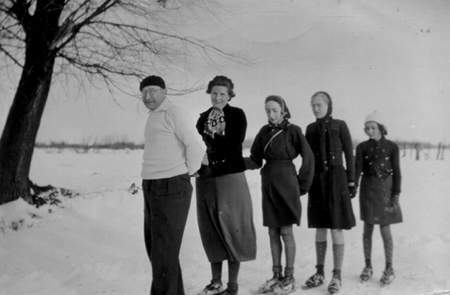 Salomon Zaligman skating with his daughters Hendrijette, Hendrika and Mientje and Roelofje Kramer on one of the lakes in the surroundings of Giethoorn. Salomon was a clever businessman and regularly advertised (with his picture) in the papers. He claimed that his wife Evelien could make the best coffee in Meppel. It was a service of the shops in Meppel to serve coffee for the customers, especially those from outside the town. Not only did the two brothers Sale and Flip sell their goods in the shop, they also went on the road with their packs. Salomon went to the villages in the surroundings of Meppel and sold his goods from a loaded car to the many customers they had there. WWII did not start all that bad for Salomon, for on 17 May 1940 he sold twenty blankets to the Germans for fl. 129,50. He was even paid! Hendrijette and Hendrika, students at the Rijks HBS (state grammar school), could attend a Jewish school for further education in Zwolle. 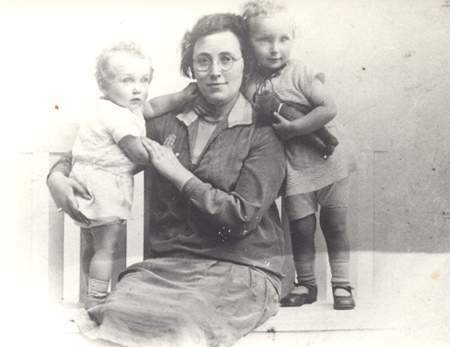 Miena, who was in the third form of primary school had to stay at home till February 1942, when there was a Jewish primary school in Meppel at last. Evelien Zaligman with her daughters Hendrika and Hendrijette. The next blow came on 1 November when they were forbidden to run their shop. The shop was closed, their license withdrawn and the goods were removed after stock-taking. When in November 1941 Salomon Zaligman’s license to sell textiles was withdrawn, he tried to keep part of his stock from the hands of the German occupiers. On a very cold day in November or December my father told me to accompany Sally Zaligman-that is what we called him in Meppel- on my bicycle to take away goods from his shop. There we went; loaded with yarns, ribbons and materials, cycling towards Havelte. At first we cycled along the Drentse Hoofdvaart and past Havelte we went into the country. I understood very well that this time it was not to do business but to safeguard part of his stock with acquaintances and relations. He knew the area very well, for he was from Dwingeloo- a village in that region- and had done a lot of business there. I still remember it was so cold, that on our way back we warmed ourselves near the oven of a baker at Havelte. A premonition? Further humiliations came in 1942 when the Germans made driving a car impossible. Furniture and household goods could not be sold any longer, the yellow star was introduced, and the 2nd Liro regulation saw to it that more money and valuables came into the hands of the Germans. They had to hand in their bicycles and travel was made virtually impossible. Trouble really began on Saturday 20 June. By order of the Sicherheitsdienst Salomon was arrested by the police at 15.00 hours. At 20.30 hours the same happened to Mr. A. Dekker, who lived at 22 Kastanjelaan. The charge was: Mr. Zaligman had sold goods that had been confiscated by the Germans to Mr. Dekker. The latter had stored 6 spring mattresses, 2 bedsteads, 2 straw mattresses and a chair for him. Both stayed in a cell at Meppel police station till 22 June. That day they were transported to the Sicherheitspolizei in Assen. Mr. Dekker was released a few days later, but Mr. Zaligman was not. On 3 July he was transported to Westerbork and on 16 July deported to Auschwitz, together with 585 other unfortunate people. It was the second deportation transport to Auschwitz. Salomon Zaligman was the first Jew from Meppel to be killed in the gas chambers of Auschwitz; on 28 July 1942. Why? He had tried to keep part of his stock from the hands of the Germans. In the night of 2 to 3 October all uncertainty ended. It must have been sheer agony for mother Zaligman and her three daughters. This was the darkest night in the history of Meppel. They did not see the father in Westerbork. Did they know he had already been killed? Evelina, Hindrijette, Hendrika and Mientje only stayed in camp Westerbork for a few days. On 9 October they were deported, with more than 1700 other people to Auschwitz. They were on that crowded train for three grueling days. They died on 12 October 1942, nine days after they had been fetched from their home. ‘De Horizon’ was the textile shop of Salomon Zaligman and his wife.